Chad claims to have killed feared al-Qaida commander in Mali. The trade in human beings thrives on the road to Europe. 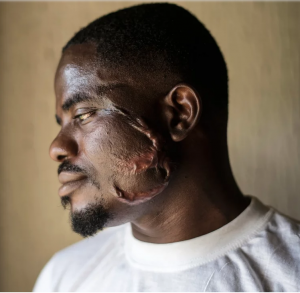 Iabarot left Nigeria in February 2016 with a plan to head northward and buy passage on a smuggler’s boat destined for Europe, where he had heard from friends on Facebook that jobs were plentiful. Iabarot is among an estimated 650,000 men and women who have crossed the Sahara over the past five years dreaming of a better life in Europe. Some are fleeing war and persecution. Others, like Iabarot, are leaving villages where economic dysfunction and erratic rainfall make it impossible to find work or even enough to eat. 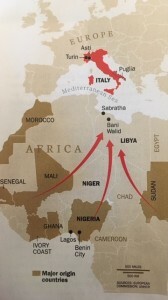 To make the harrowing journey, they enlist the services of trans-Saharan smugglers who profit by augmenting their truckloads of weapons, drugs and other contraband goods with human cargo. But along the way, tens of thousands like Iabarot are finding themselves treated not just as cargo but as chattel and trapped in a terrifying cycle of extortion, imprisonment, forced labor and prostitution, according to estimates by the International Organization for Migration (IOM) and the U.N. Office on Drugs and Crime. “They are not only facing inhuman treatment. They are being sold from one trafficker to another,” says Carlotta Sami, southern European regional spokesperson for UNHCR, the U.N. refugee agency. Essentially, they are slaves: human beings who have been reduced to being possessions with a fixed value, based on assessments of the kind of income they can accrue to their owners as targets for extortion, as unpaid labor or—as is often the case with women—prostitutes. U.S. Boosts War Role in Africa.